As parents who quickly become attuned to our child’s strengths, struggles, and achievements, it can be daunting to imagine handing our kid off to a teacher come August. We hope these new adults in our child’s life understand our child just as well as we do. Selecting the right academic environment for your student may make the transition easier to deal with. 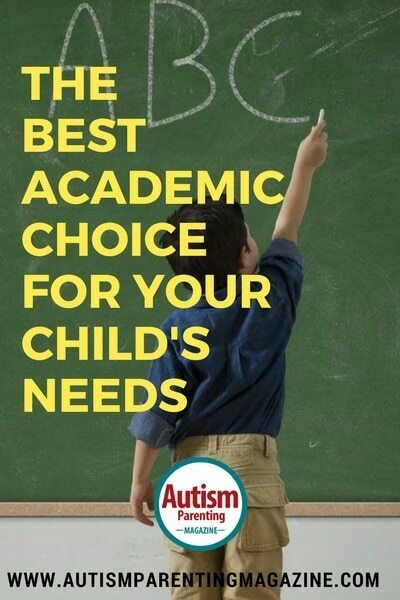 When it comes to education and the autism spectrum, it is important to understand all of the options available. This is the most traditional option when it comes to education. Public school caters to a wide population, and there is a wealth of special education services. Teachers typically possess the necessary qualifications and experience required to understand children with special needs. Important bonuses—such as before/after school care, transportation, and lunch—are generally provided. Your child may qualify for an Individualized Education Plan (IEP). An IEP is a document that acts as an agreement between you and your child’s teachers, outlining the services and methods that will be used to help your child reach his/her potential. The IEP is revised yearly and will follow your child to each public school he/she attends. This ensures predictability and consistency in your child’s education. Public school is not without its challenges for a child with autism. Long days and overpopulated classes can pose difficulties for children who are highly sensitive to their environment. Likewise, your child’s success will largely depend on standardized testing and objective grading systems, which may or may not accurately reflect his/her true ability. Many parents find they must over-advocate for their child in the public school environment because there are so many students assigned to one teacher. The only major interaction you will have with your child’s teacher is during conferences, which only occur a few times a year. Prioritizing communication with your child’s teachers will be key to success. Charters schools are public schools, but they are schools of choice. This means that the school is funded by the government and must meet all or most of the same regulations as your local public school. However, you elect for your child to attend that particular school instead of being assigned to it by your address. This gives you greater freedom in selecting a school environment with which you are comfortable. Each school is unique in its mission, curriculum, methods of teaching, and standards of mastery. Charter schools may base themselves in arts or science, require training in music, or integrate two or three different languages into their curriculum. Charters schools are often led by local parents and community members, which means parent involvement is high. Because they meet the Individuals with Disabilities Education Act (IDEA) standards, charter schools will cater to special needs students and follow an IEP. As with public schools, charter schools are subjected to state and federal guidelines, including controversial standardized testing. Some schools may have a highly alternative curriculum that may not appeal to your child’s strengths or interests. For example, if a child is having difficulty with English, speech, or social communication, interacting in Spanish or Mandarin could be equally or more difficult. If mastery of another language is a requirement of the school, the child could easily fall behind. Charter schools are often unpredictable. They are only funded if they meet certain performance goals. If these goals are not met, the school can be closed at any time. Despite this, charter schools are in demand. Most operate on a lottery system, meaning a high number of applicants submit applications in the spring and only a few are randomly chosen. Limited funding also means the charter school may lack important facilities such as a gym or playground, and services such as before/after school care may not be offered. A private school is a great option if you feel your child requires a specific academic curriculum that operates independently of public school requirements. Many private schools offer highly specialized programs that focus on art, science, or religion. For students who excel academically or who want to study within a certain academic or religious context, private school offers the opportunity to connect with like-minded peers. A major drawback of private school is that certain documents, such as the IEP, are not guaranteed. Some private schools offer a disclaimer that students with special needs may not receive all the services that would benefit them. This means it may become your responsibility to find additional resources outside of school, potentially at out-of-pocket costs. Private schooling is also the most expensive educational option. Expect large tuition bills and a general need for fundraising. Many parents of children on the autism spectrum choose homeschooling because it provides a highly-controlled environment for the child. As the parent, you decide the length and structure of the school day, the material covered, the amount of social interaction, and the special services your child has access to. The one-on-one attention is a highly desired benefit, as it allows you as the parent to get immediate feedback on your child’s success. Homeschool can be a challenge for a family with parents who work, especially outside of the home. As your child’s sole educational resource, you are not only responsible for teaching, but also for lesson planning, grading, and supplemental instruction as well. These responsibilities can add up to a large amount of time outside of the “school day.” Likewise, costs for learning materials will come directly out of your pocket. Some parents also find the lack of a third party, such as a teacher, intimidating. Many children with autism have social challenges that will require some extra work outside of one-on-one academics. Joining local homeschooling co-ops, small groups of local homeschooled students, can help facilitate that important social interaction your child may need. Social media is a great way to initiate those connections. Online school is like homeschooling in that it is typically done from the home, or outside of the traditional school environment. Sometimes referred to as “virtual education,” these programs allow your child to have access to a fully licensed teacher who provides individualized curriculum through various multimedia resources. A major benefit to online schools is that they are usually tuition free, and many programs begin as early as Kindergarten. There are various programs available online, and K12 and Connections Academy are popular accredited options. Some programs offer virtual clubs to help your child connect with peers, and you may even have technology resources delivered right to your door. Online school provides the comfort and freedom of homeschooling without the extra impact to your wallet. Although it is similar to homeschooling, online school will be more structured. Instead of managing your child’s education, you will take on a more observational role. Some programs refer to this role as a “coach.” Online schools are considered “public” schools, and they are required to meet many of your local district or state laws. This includes mandatory standardized testing. Since your child will be learning primarily through online resources, he/she will be spending a great deal of time at the computer. While technology is a great learning tool for many children with autism, it is important to remember the computer screen is a highly visual tool. Children with visual sensory preferences may find the computer excessively distracting. Family schools are increasing in popularity and are a compromise between public school and homeschooling. Family schools are often a branch of the local public school system and offer an alternative schedule where a child attends for a percentage of the traditional school day. Supplemental instruction is sent home and is completed during “homeschool hours.” An adult in the home is responsible for the education of the student during homeschooling sessions, including instruction of new material. Family schools tend to have smaller classes, and the teacher gets to know each child on an individualized basis. The material that is sent home is chosen by a qualified instructor, who understands your child’s strengths and opportunities well. Many family schools allow the student body to steer the lesson material, which gives your child an opportunity to explore his/her interests. The shorter school days may be more tolerable for special needs students, and as the parent, your communication with the teacher will be frequent and open. Family schools that are part of the local public school system are still required to utilize standardized tests and meet other regulations, as defined by the local, state, or federal government. “Electives,” such as art, music, physical education, and computers, may not be included in the curriculum due to the abbreviated school schedule. Schools that operate independently may lack the facilities available in a public school, such as a playground or lunchroom. Family schools are increasingly in demand, which is resulting in programs with long waitlists. Family schools may not have special education teachers who remain on the premises. This means your child may have limited interaction with a professional who can render speech, occupational, or other behavioral or physical health services. Likewise, your IEP may or may not be officially recognized. Each school operates on its own schedule. Your child may only attend on certain days of the week, or for half of the traditional school day. This requires an adult who will be responsible for maintaining the alternative school schedule and overseeing homeschooling success. Some schools also require parent-training programs, which may occur outside of school hours. When selecting an environment for your child, it is important to recognize the priorities of you and your family. Does your child need one-on-one interaction? Do you need an environment that provides special services? Are you comfortable with IEPs or standardized testing? Remember that what works for someone else’s child may not work for yours, so allow yourself time to fully explore all the available options. Advocate for your child when you feel his/her environment is not the best, and don’t be afraid to reach out to your local community resources when weighing your options. Gabrielle Benitez is a freelance writer who is passionate about autism awareness and helping parents feel empowered by the choices they make for their children. When not writing, she enjoys reading, cooking, and spending time with her family. Her body of work includes various pieces on health, nutrition, education, and parenting. She can be reached at gbfreelancewriter@gmail.com.